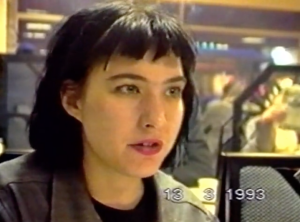 In spring 1993, riot grrrl bands Bikini Kill and Huggy Bear, accompanied by the filmmaker Lucy Thane, embarked on a tour of the United Kingdom. Bikini Kill vocalist Kathleen Hanna set the tone when she opened a show at the University of Sheffield by asking: “Do you believe in the power of now?” Many clearly did, and the tour became a landmark event in the history of riot grrrl, especially in the United Kingdom. While the aptly named film that Thane made of the tour, It Changed My Life, is twenty minutes long, Thane’s complete footage has been digitized and is held at the Fales Library & Special Collections as part of the Fales Riot Grrrl Collection. The Lucy Thane collection is an important document of riot grrrl at one of its most explosive moments, but it has been underused. This partly stems from description. The original finding aid used descriptions taken from titles or notes scrawled on the original VHS and Hi8 tapes; while this is a necessary step prior to preservation and digitization, the titles were limited and in some cases inaccurate. In order to augment the metadata and to enhance access to the collection, I have been writing new item level abstracts for the collection, which appear as scope notes in the collection finding aid. Some themes are prominent throughout the footage. Lucy Thane regularly ends the shows by interviewing fans in the women’s bathrooms and outside the venues. They discuss, amongst other things, feminism, lesbianism, and the politics of makeup, often asking themselves and each other if they are riot grrrls—in fact, a common question is What is a Riot Grrrl Anyway? While this reflects the conversations held within the broader riot grrrl movement and community, there are also constant references to how the movement is labeled by external commentators, specifically journalists. Prior to reading Ragdoll Hanna stops to ask a man in the crowd why he is leaning on a woman and replies, “yeah it’s cool when guys act feminist to get your phone number. 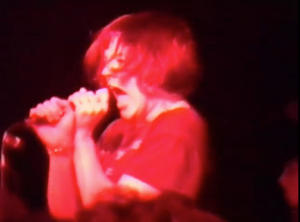 Oh I’m on stage now so you have to shut up.” The relationship between the band on the stage, the audience, and women and men within the audience, was and is one of the dominant features of riot grrrl and it is a common theme in Lucy Thane’s footage. Microphones are passed to women in the front row, women are invited on stage to make announcements, and in one interview Liz Naylor, who organized the tour, praises both Huggy Bear and Bikini Kill for re-approaching and re-defining the band-audience relationship. But there are also points of tension, and two shows —in Newport and Derby—are never shown but frequently mentioned. These shows were ones in which Bikini Kill and Huggy Bear experienced the most animosity from the crowd, and they form a benchmark from which many others are judged. In one fascinating segment, Hanna and Naylor listen back to a recording of the show in Newport and discuss Hanna bringing two male bouncers onto the stage, and the dynamics of power and gender between the band, the bouncers and the male members of the crowd. This is also where you get to hear an impromptu chant of the chorus from Rebel Girl start amongst the female members of the crowd, before Hanna repeats it back with the lyrics changed to “Wales Girl” and the band then launch into the song itself. 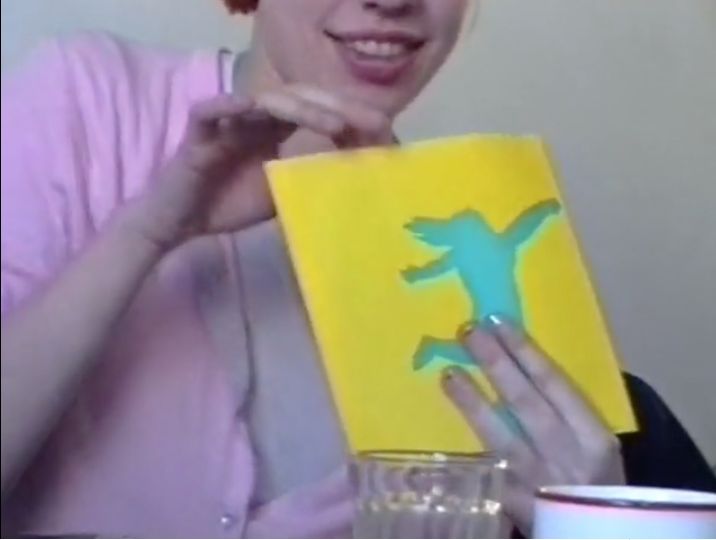 This is only a fragment of the collection—additional footage ranges from backstage scenes and interviews, to Tobi Vail of Bikini Kill theorizing the role of donuts as a cultural artifact. At points the recordings repeat themselves, at others the sound quality is poor. Evidently It Changed My Life required some of these edges be smoothed out, but there is something exhilarating about the raw footage. Thane’s style of filmmaking, in which she is constantly present and where the borders between filmmaker, camera, subject, and audience are fluid, only adds to the experience. In fact some of the best footage comes from the informal interviews conducted in women’s bathrooms—often during which the camera and the role of interviewer alternates between multiple women. The Lucy Thane Riot Grrrl Collections provides a unique window into the 1993 tour and forms a crucial part of the story of riot grrrl. But it also answers Naylor’s call; it did change lives, and it has been documented.